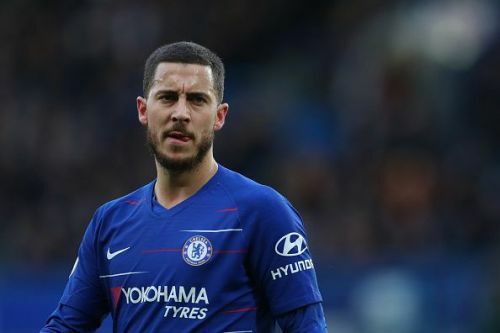 The Eden Hazard and Real Madrid saga has been going on for months but it finally appears to be nearing its end as the Belgium international has announced that he has finally made a decision regarding his future. Although the 28-year-old did not reveal the decision, it is believed that a move to his dream club Real Madrid would be the probable option. Speaking to French radio station RMC (via The Guardian), Hazard said, "I know what I am going to do. I have made a decision." The Belgian's open love for Real Madrid and his looming exit has been an unwelcome development for the Blues, as the talisman has played a pivotal role in Chelsea's exploits this season. Last year, Hazard vocalized his love for Los Blancos saying (via Goal), "I am really in the game, I am playing good football at the moment. Real Madrid is the best club in the world. I don't want to lie today." "It is my dream since I was a kid. I was dreaming about this club. We will see. I don't want to talk about this every day. I don't have time, but we will talk about my future soon. I think so. It is also when you have a dream and you want to make it happen." The Blues star is reportedly set to inform the club about his decision and it won't be surprising to hear of it soon. Fans have since taken to Twitter to express their thoughts on the Belgian's recent comments. Here are some of the best tweets. @hazardeden10 👋🏽👋🏽 Au revoir Eden , been a pleasure watching you play for Chelsea . Heck some weeks I only watch Chelsea games to watch Eden Hazard . this is definitely Hazard's last season in Chelsea. We really have a player talking to the press every month about whether he's going to stay or leave the club? Need Hazard to shut up for once.